We departed our anchorage at Eastham Creek at 6:30am heading toward the Pamlico River. Today would be a pivotal day on the ICW. If we can get under the 64′ Wilkerson Bridge – we would be able to continue northward on the ICW into Norfolk VA. If not, we had to turn around and go back to Beaufort – where our only option would be to sail north via the Atlantic Ocean – with a boat that has steering issues. (oh joy!) If all goes well, we would motor as far north as CoinJock NC – putting us within 1 day of reaching Norfolk. 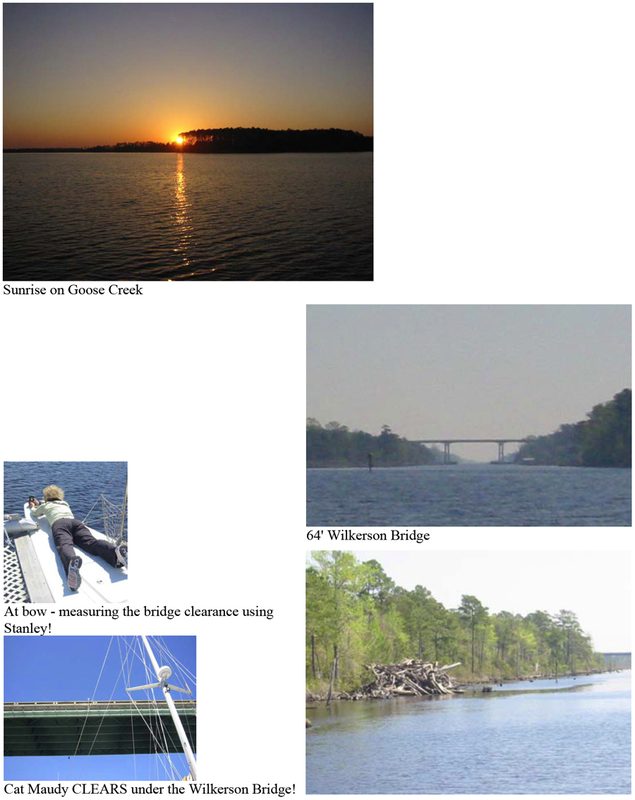 The fixed bridges along the ICW are supposto be 65′. So, why is this ONE fixed bridge short 1 foot? Apparently the Wilkerson bridge was designed to be 65′ when it was built. Rumor has it — that when the bridge construction was complete – it was only THEN that it was discovered to be short by 1 foot. Duh? Apparently, someone on the construction job could not follow the schematics. By 10:30AM – we were about to find out if Cat Maudy could get her tall body under the Wilkerson Bridge. Pat slowed us down to a near halt….and we inched forward toward the bridge. I was belly-flopped on the bow – with my tool buddy Stanley. As we inched up….I repeatedly clicked the “Measure” button….until I got a read. The first read was 68 feet. This meant I had reached a high point of the bridge. Finally, I got a read of 60′ 8 inches. Add this to our 3′ 7″ bow above the water line….meant the bridge would give us clearance of 64′ 3inches. We needed 62′ 10inches — so we should be able to clear. Oh…this would be close – and hopefully all of our Cat Maudy boat measurements were accurate. It was now time for visual analysis. As I compared the top of the mast from the bow to the top of the bridge- I should be able to see clearance. Unfortunately, I could not see much if any, clearance from below. Pat carefully inched Cat Maudy to a point where we knew she was under the first beam (lowest point) of the bridge…and we cautiously decided that it was safe to proceed. We were sweating bullets on this one — this was REALLY close. A tremendous sigh of relief – as Cat Maudy cleared the far side of the Wilkerson Bridge. With any luck – the wind tides would be diminished as we continued our journey to Norfolk — and we would not encounter any more problems with the 65′ fixed bridges. (so we hoped!) At bow – measuring the bridge clearance using Stanley! Cat Maudy CLEARS under the Wilkerson Bridge! Our next 65′ fixed bridge encounter – would be at the Fairfield Highway Bridge – along the Pungo River Canal. While we thought this bridge would be a ‘piece-o-cake-o’ — we were dismayed to find that the water levels appeared to be high. The bridge turned out to be far less than 65′ of clearance – and we BARELY cleared. Sheeez…talk about sweating bullets. I’m at the bow of the boat – and if our mast touches the bridge – all sorts of rigging and artifacts will come crashing down on top of me. Ok…back to positive thoughts! We motored thru a 23 mile land cut. This man-made section of the ICW is lined with stumps and dead tree debris — so we tried to stay centered in the middle of the channel at all times. Once through this long stretch – we would be in bigger waters (tho very shallow) — starting with the Alligator River. We began to realize the severity of Cat Maudy’s steering issues during this 23 mile stretch in very calm waters – as the autohelm routinely blew fuses – and could no longer keep a heading. The steering problem has definitely become worse. Probably whatever steering that we “had” prior to our last ocean adventure in 9′ seas — is now nearly gone. This meant that we had to hand-steer the boat at all times. Under “normal” conditions, this would not be a problem – however with the port rudder constantly meandering and not being able to synchronize with the starboard rudder – it made for difficult steering even by hand. Think of it as if you are driving your car along an empty stretch of I-95. No cruise control. The front & back wheels on the driver side of the car work as they should (in relation to the direction you turn the steering wheel) — and the front & back wheels on the passenger side — just turn in any old random direction. Sometimes the passenger side of the car goes to the right…other times to the left — you never know when or how much it is going to pull. This is what is is like steering Cat Maudy. Whenever we noticed that we were losing speed – this would become our trigger to make adjustments to the port rudder. Captain Pat would have me disengage the hydraulics to the port rudder – allowing him time to re-align the rudder to the starboard side. Once aligned – I would re-open the pressure valve – and the rudders would become synchronized – temporarily that is. This method of re-alignment was occurring at least once an hour. La-la-la-la-la….it is a beautiful day, light breezes and we are relaxing. The autohelm appears to be working again for the moment, and everything is lovely in the world of Cat Maudy – lazing along on a Friday afternoon in the Alligator River. We were in remote countryside – no houses, no cell phone service, no internet. We had the jib sail out – and gained about a knot of speed. When suddenly, out of the clear blue sky (literally!) – a US Air Force fighter jet traveling at what appeared to be super-sonic speeds roared less than 300 yards over our mast. The sound was so loud at this close range – that our cats (Earl & Soxy) bolted from the cockpit to hide in the hulls. We instinctively covered our ears – and then Pat & I stared at each other in total disbelief. Holy-karumba! That fighter jet was DANGEROUSLY close to our boat! Did we drift aimlessly into a restricted military base? Did Cat Maudy’s steering take us way off course? The military boys could have just hailed us – and we would be more than happy to change course! I quickly checked the chart — and there was no military restricted zone anywhere on the Alligator River. As a matter of fact – we were completely ON COURSE within the channel of the ICW. It was a bit unnerving to have a fighter jet swoop out of the ‘friendly skies’ toward your boat. Unfortunately, we found that the aggression was about to escalate. The skies are not so friendly today. 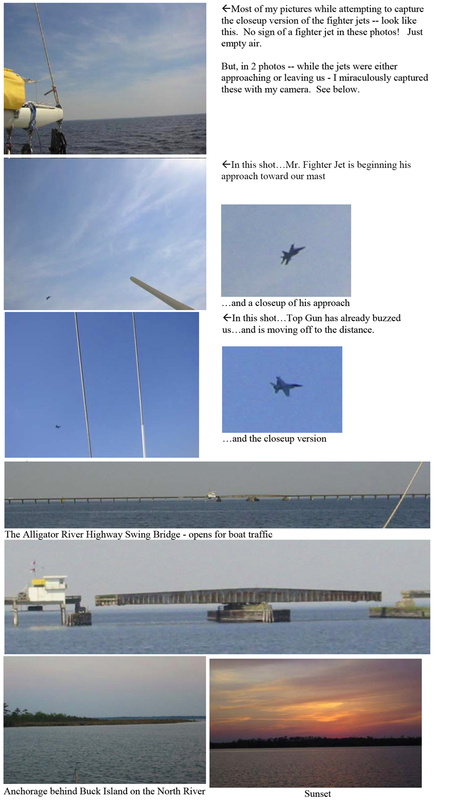 For the next 10 minutes – this same US Air Force fighter jet — occasionally accompanied by one of his “Top Gun” fighter jet buddies….swooped, turned, and buzzed in and around our boat as if they were practicing how to terrorize pleasure boats on the ICW. They would dive down toward us, turn on their side in the final seconds….and disappear off into the horizon….only to reappear time after time. I tried to capture this on camera – our very own US government air force gone completely insane – taking on a catamaran trying to go north on the ICW. These fighter jets were so close to our boat – I could have seen their serial number – if it hadn’t been for the fact that they flew at warp speeds. While I took a ton of pictures – only 2 pictures shows a glimpse of the fighter jets (at further distance). My camera could not capture these jets at close range — within a split second they would disappear….and by the time my camera clicked…they were long gone. Eventually, the fighter pilots got bored with toying with us — and we returned our thoughts back to sailing, steering a handicapped boat, and navigation. A huge bridge crosses the mouth of the Alligator River – with a single pivot swing bridge located in the mid-section. Apparently, if it is too windy – the bridge-tender will not open the bridge allowing boat passage. Fortunately, the winds were light (15 knots) – and we were able to continue north – into the Albemarle Sound. We raised the jib – and motor-sailed across the Albemarle – with Captain Pat hand steering the boat. It was getting to be a bit of an upper body workout to control Cat Maudy – even in light winds. She wanted to wander – and getting her to stay on any course was quite a struggle. Finally, we decided to bypass the port rudder – and simply let the port rudder stay in a fixed position. All steering would come from the starboard rudder. Still not the best – because the port rudder no longer synchronizes with the starboard rudder — but at least we can prevent the port rudder from meandering. This seemed to help a little — but no significant improvement. Eventually, we crossed the Albermarle Sound, and motored up the North River in a very narrow channel with shallow waters on either side. By 7:30PM, we found an anchorage in 7 feet of water just north of Buck Island – and made that home for the evening. It was a beautiful, completely remote spot, but there was no chance of sitting outside to enjoy it. Within minutes we were covered with mosquitoes. We huddled inside the salon – with doors and hatches shut tightly. It was a long day of motoring – and we were within 5 miles of our goal for the day – Coinjock NC.